This rabbit was designed in February, 1999. I had hoped to have it ready for Chinese New Year, but I missed by a couple of days. 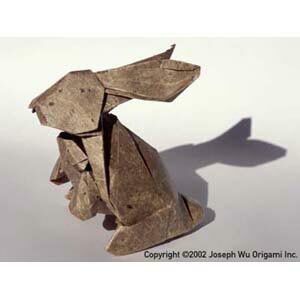 Continuing on from my baby elephant model, I designed this rabbit with the objective of folding a three-dimensional animal with as small an opening as possible (the opening is in the front of the neck) and that could be sculpted without wet folding using a dry tension technique. In order to achieve this goal, the model is folded from a 3 by 2 rectangle.